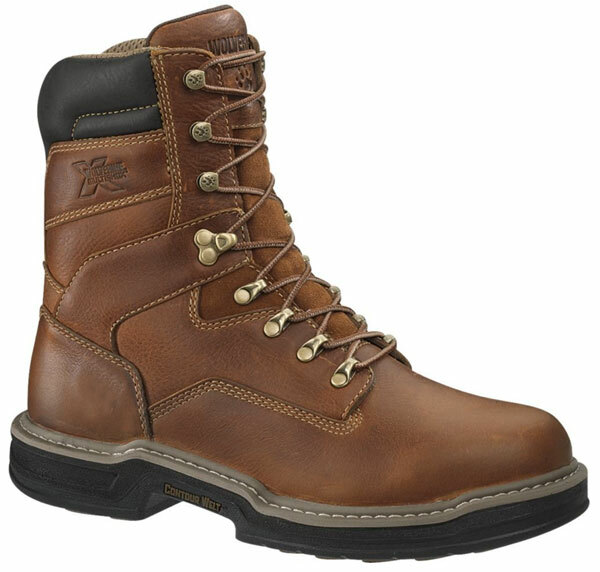 Reader Question: Cheap, Durable, Non-Steel-Toe Boots? For about 12 years I wore a pair of black Dr. Martens cap-toe boots. They were tough as hell, reasonably waterproof, super comfortable, and they shined up nice to make for great dressy shoes as well. But they’re more cheaply made now, and they no longer have the classic work-boot tread pattern, opting for a pavement-loving design. I suspect the material will not last as well, either. So I’m looking for a new boot, but I’m having a hard time finding anything I like except some really expensive boots from Wolverine and Red Wing. So what might work for him? A round toe. A cap toe would be great. No steel toe if possible. Shanks are fine, though. Affordable, as in not $500. Finally, he doesn’t care where they’re made or who makes them. He just wants the boots. I’m not sure their construction matches Joel’s specs entirely, especially considering that they featured a slightly rough finish. That said, I’ve personally seen Sean slip them in as dress shoes. Hell, he wore ’em to a couple of meetings we attended together before we launched Toolmonger and I didn’t notice until the second or third meeting that they were actually work boots, so they definitely meet your “swap ’em out for dress shoes” criteria. Come to think of it, the set of Wolverines we tested way back are still available on Amazon for around $150 — a lot less than the $500 Joel mentions. That’s it pictured at the top of the post. These make great dress-look boots, yet they’re extremely durable. They do scratch a bit, but careful polish work can make that go away — and add a nice patina. Anyway, if you have any recommendations for Joel (or us, for that matter), we’d love to see ’em in comments. 39 Responses to Reader Question: Cheap, Durable, Non-Steel-Toe Boots? Save yourself a headache and get two pairs of shoes. cheap & durable, you can have one but not both if you want a quality pair of shoes. You can get a darn good pair of redwings in the $200-300 range. The boots Chuck is referring to are Brahma work boots from I got from wally world a about 4 years ago. The previous pair lasted about 5 years. They are full work boots with a suede type of finish. However, they also make a polish-able version of the same boot. Both styles are still available at Wal-Mart for less than $30. Love ’em. Huge fan of Belleville military boots. I just picked up another pair as winter boots, the GoreTex and insulated flight boots, for $150 shipped. I really like my Danner Tillamook boots. It appears they have discontinued that model, but these others are similar. Check out Thorogood boots on Amazon. Love my cap toes and they are made in Wisconsin with US leather. Recently at Costco i picked up a pair of Carhart boots for $60 real leather, and well built. Except that in a week the right boot started hurting my foot. I believe the two pieces of leather that meet above the heel is the culprit. I would not take these shoes if they were given to me for free. Let me rephrase that i will not take them if someone paid for me to wear them. A work boot is suppose to be comfortable not cause you to cringe in pain. But maybe i just got a bad shoe. I needed a pair of oxford work shoes for summer wear, and like Joel I also wanted them to do double duty as “dress” shoes to go with my firefighter parade uniform. I was at the local Army & Navy store and found a pair of Worx shoes, made by Redwing. These things are nothing short of incredible. I have dug footings; poured concrete; cleared brush from a shale bank behind my house; and generally abused them for the past 7 months. They still look like a million bucks after a very quick shine job (they are black). I recommend these shoes for any trade on the planet. They do come in boot styles also, some for around $55. Look at a MAGNUM boot. Super, super light, almost like wearing house-slippers with a steel toe. Hold up very well so far as I’m concerned. i saved money by going to red wings. and my feet no longer had problems. I wear Danner boots. They have different styles and are comfortable, but not cheap. They run in the same price range as Red Wing. They may be a bit more than you want to pay, but I’m a big fan of Ariat boots. I don’t have experience with their normal work boots, but I have two pairs of their cowboy boots, and they’re great. Very durable, very comfortable, and they look great! I got a pair of 1 year old redwings off ebay for $20; retail $157; last year.Wear them every day at the job site and feel fantastic. Used is not for everyone but just another option or a thrift store; you would be amazed at what you can get. I can’t really say much about work boots – mine are ok but couldn’t pass as dress boots no matter how you tried to shine them up! However I do have some comments about Doc Martens that Joel brought up. I’ve worn Docs pretty much exclusively for 20 years now, classic black 8 and 10-ups. Unimaginative of me I know :-). When they got a bit too battered for polite company (which took a while) they became work boots until the tread wore down and they got slippery. I’d expect a 2-3 years normal service and a couple of years work service. I got a new pair a couple of years ago and Joel is right – they are more cheaply made. Or rather the uppers are greatly inferior. The sole on the boots I buy is still exactly the same AFAICT, welting seems the same, no complaints there. The leather is much worse though. It’s thinner, harder, less flexible and marks much more easily. I’ve never had to break in a pair of Docs before these ones and even after quite some wearing they still rub sometimes. Far less comfortable. The leather marks so easily that even with a good shine they’re not quite dress shoes. You have to be careful with them which I’ve never been before. Not sure about getting another pair after these. Not to go off on a fashion tangent here or anything, I just wanted to confirm Joel’s thoughts about the durability of Docs now. I used to be a boatbuilder and they were great workboots then. Epoxy and such didn’t bother them whereas the sneaker type shoes most of my co-workers wore would harden up and crack. Normal work boots were too stiff for working in boats comfortably. My feet don’t sweat, never sore, big toe box, great grip, etc… and I don’t work for the company. I wear the Pit Boss Pros for heavier cool weather work, and they are durable, but they are Timberland, not Wolverine. 1-if it’s a work boot, it’s gonna get dinged, and it won’t be a dress boot. do you want to polish it to improve the leather’s life, or are you wearing it as a fashion item rather than functionality (as no steel would suggest)? either way a redwing, doc marten’s or asolo hiking boot is a very solid option each of which would also function very well as a fashion item in addition to work wear. 2- why not steel toe? cold? what about non-metal safety toe? there are a number of safety toe boots that are wider toe box and very comphy, and if it’s a “work” boot you want to keep your tootsies. if you’re worried about additional dings on the toe, then you don’t want a work boot anyway, you want fashion, and may as well buy a pair of dress boots. Dickies basic work boots cost about $60, they are much more durable than the Brahama things wally-world has. Mine are going strong at 3 years. I’m not a contruction worker but I do visit construction sites and work a lot at home. Many folks mention the longevity of the higher quality/higher priced boots. Remember though that if you paid $150 for a good pair and they lasted 5 years (I would think longer) you be paying $30 a year. If you bought the cheap boots, you will likely have to buy more often. As for wearing for work and dress: No matter how comfortable the boots, it always felt good on the feet to change into really comfy shoes when leaving the job site for the day. Toss the muddy boots into a bag to be cleaned off (maybe) after getting home. Wear work boots at work and shoes when not working – not for everyone but it sure works for me. I really miss the Sears Die Hard boots that had the stitched toe and actual heel. Now they only sell the stitched toe with the flat pancake looking sole. Not the same. On another note: How about a winter work glove review? Weather is coming and I’m searching out a new pair of gloves. Maybe Pigskin Kincos. dude I got hytest carbon fiber for $120! Good boots!!!! Very durable, comfy and take a great shine. I love my Keen hiking boots, so when I found out that they made work boots I knew those were my next ones. I recently picked some up and they’re the nicest work boots I’ve had. Mine were $160. I took a pair of of those wally world out in less than four months. Split the uppers along the steel cap due to wear and tear. I teach in an environmental science program, so I do a lot of bending, kicking dirt, kickball, carpentry, stuff like that. I’m also obliged to dress like a “classroom” teacher – dress shirt and slacks. I’ve found Ariat cowboy-styled workboots, and really any boot with a replaceable sole, a workable solution. It takes me about six months to rundown a sole, about two to three years to destroy an insole. I haven’t tried any Redwings, but I’m giving them a try next. I just bought a new pair of Georgia Giant work boots and they were like walking in my current Adidas trail shoes. The most comfortable shoes…errr, boots I’ve worn. $80 on sale. OK, but none of those boots have lasers on them. And as we know, everything needs a laser these days. No, but seriously – I’m wondering if anyone has any suggestions for a non-leather work boot or shoe for those of us who are vegetarian? I’ve been wearing trail running shoes for the past few years which have some pluses (good grippy sole, comfy for long days on the feet), but wouldn’t mind something more durable. I also have a pair of the suede finished Brahma work boots Sean mentions above. I’ve been very pleased with them and the $25 sale price just sweetens the deal. They’re nowhere near as nice as my Wolverine steel toes but they are much lighter and I don’t feel like I’m wearing cement overshoes. YMMV. Really. No Bull. I’m a mech – live on my feet. WorkWear by Wranger at K-mart – I get 8 or 9 months out of a pair with a Dr Scholls insert. Lightweight and roomy! I’ve also heard good things about Solovair (https://www.williamlennon.co.uk/footwear/38B-solovair-boots.html) but haven’t tried them out myself. Hate to be late here but why buy such crappy boots. You can buy these boots from Sierra Trading Post with usually a 25% discount. Just search online for STP discount coupons. These waterproof boots were the #1 rated hiking boots in the world. I am on my 4th pair and I can wear them 12 hours with no problem. Lots of support and not heavy at all. I bought Brahma Boots to wear for my first day of work on a landscaping job. I stepped out of the boss’s truck and tripped because the sole was flopping loose. I tried walking with it so I could do my job on the first day. Then the entire sole fell off and I walked around like that all day. At the end of a long painful day where I walked on gravel, rock, mud and pavement my foot was sore, bruised and blistered. Also my back hurt from walking at an odd angle with no sole on one foot. And I had no boots to wear the following day and no more money to buy any, so no job. I’ll never buy another Brahma product. I agree that Chippewa is the best on the market . I owned a pair of these for three years with no complaints. These things took a beating and never broke down, you can be working in the rain, mud, snow, sleet what ever and your, feet will stay dry and warm the ENTIRE day, it even keeps them relatively cool during the summer. The soles have great traction, even in the snow which is tough for most work boots as the snow gets packed into the treads and ices up. Don’t get me wrong you have to kick them clean every now and then but compared to others their pretty stable in snow. your suggestion is good. But to myself its outdated for now. As market has new brands who made really good work boots. Hope you update your info. I believe the two pieces of leather that meet above the heel is the culprit. I would not take these shoes if they were given to me for free. Let me rephrase that i will not take them if someone paid for me to wear them.